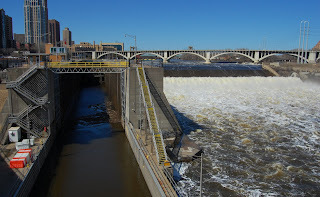 Saint Anthony Falls is the site of the uppermost navigational locks of the Mississippi waterway. This is the upper dam, built (and operated) by the US Army Corps of Engineers in 1963. The limestone supporting the falls steadily eroded causing the falls to recess upstream, until a permanent spillway was installed in 1871. I'm not certain why the locks are necessary - they only give access to 12 river miles before St Cloud, and there isn't much industry in that stretch. Like most structures built with federal money, they are well engineered.